BOHH Labs is an innovative San Francisco tech company that has introduced a unique solution to the problem of securing and accessing complex business data. Their patented service enables simple, real-time access to data securely without compromising business performance or placing data at risk. The BOHH Labs technology team has a distinctive track record in enterprise software and search, data security, and customer service solutions to enable users to securely interact with their data, systems, and applications. As a startup with an immediate need for their first website, the project timeline was compressed. While a goal was to create the homepage within weeks, it was also necessary that the complex message of how the BOHH Labs Secure Application Gateway works, it needed to be explained in a concise and clear manner that would resonate with both industry professionals and laymen. The client wanted a dynamic way to present the steps of the process from collection of data to response. 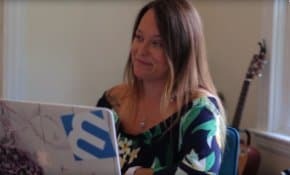 A crucial requirement for the site was for the client to be able to easily update the content on the website since the content and website were very fluid. They also wanted to show the applications of their technology with examples that can be easily accessed by the web visitor. Lastly, along with being responsive, the client also wanted the site to conform to accessibility best practices. Using an animated step-by-step illustration, 3 Media Web met the client’s goal of using few words with engaging left-to-right images to show the three steps of the BOHH Labs process: Request, Threat Analysis and Processing, and Securing the Access. These illustrations and accompanying text demonstrate clearly how the BOHH Labs Secure Application Gateway works. 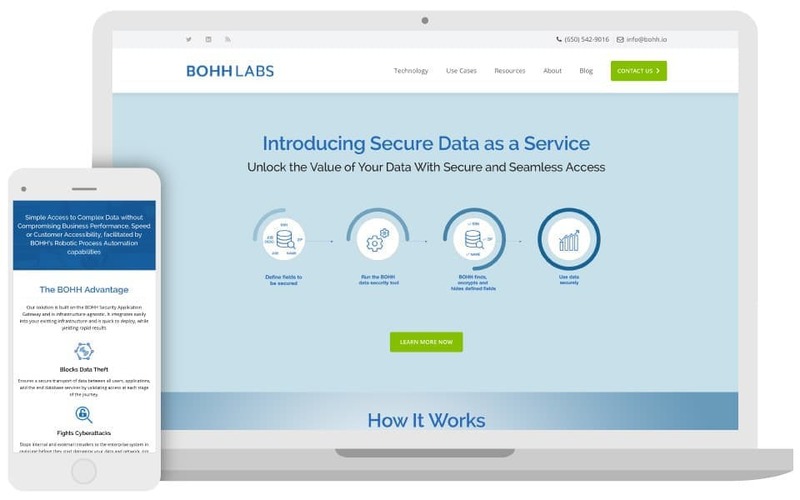 Scrolling down the homepage, the website visitor is asked: “What can you do with BOHH’s Technology?” in a banner that clicks through to the Use Cases page with text and images that address a data security problem and solution. This key page is also accessible from the homepage main navigation bar. Accessibility best practices were implemented throughout the website. The contrast of colors and the fill-in-forms were designed to be easy-to-use for those with vision issues. Images with click-through capability fade when hovered over to be more easily seen and recognized as clickable. 3 Media Web was acutely aware of the importance of delivering the BOHH Lab’s website within budget and in time for critical investor meetings. We continue to work with BOHH Labs for certain website enhancements, customized training, and technical support. 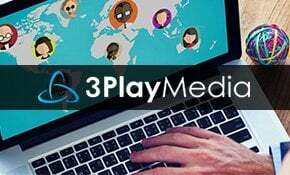 Interested in starting a similar project with 3 Media Web? How we helped a global pioneer in vulnerability risk management design and develop a website with extended security features. How we helped a leader in premium closed captioning, transcription, audio description, and subtitling solutions with an accessible website makeover and large content bank migration to better represent their products and brand. How we helped an IOT serialization + tracking solutions provider with new branding and a website redesign to upgrade the company’s overall offerings and image. How we helped a local supplier of machine tool products improve their overall brand with a new website that includes a cohesive catalog for their worldwide customers. How we helped an innovator of estimating and project management software build a custom website and fully-featured scheduling application. How we helped the largest and most respected MEDITECH consulting firm in North America improve their company image with a website makeover and produce a resource database for customers. How we helped a leading HIPAA secure Incident Alert Management System increase leads and improve content delivery with a new Website Makeover and custom Salesforce integration. How we helped a cloud-based platform parking management operations solutions software rebranding and website makeover. How we helped a leading provider of digital imaging products, accessories, systems and solutions with a website makeover and easy-to-manage product catalog. How we helped a provider of professionally recorded voice prompts, messages, and narration, for phone and web-based applications with new branding, an award-winning website makeover and a custom searchable application for customers to easily browse voice selections. How we helped a global provider of water testing with a website makeover that included marketing automation integration to improve the company’s inbound marketing efforts. How we helped a provider of open source software for clinical data management with a responsive website makeover to better promote their products and support developers. How we helped a cloud-based software company with a responsive website makeover to better reflect their product, brand and messaging. How we helped a team of technical marketers and their content marketing agency, Reputation Capital, launch a beautiful, responsive new website design to better reflect their products and services. How we helped a global IT software company seamlessly integrate a custom design onto onto it’s already existing web technology platform. How we helped a global IT networking company improve their inbound marketing efforts with the integration of marketing automation tools into their already existing website. How we helped a global leader in optical communications products tackle a website design makeover on their existing website. How we helped a publicly-traded clean energy technology + solutions provider with a website redesign that increased user engagement by 300%.